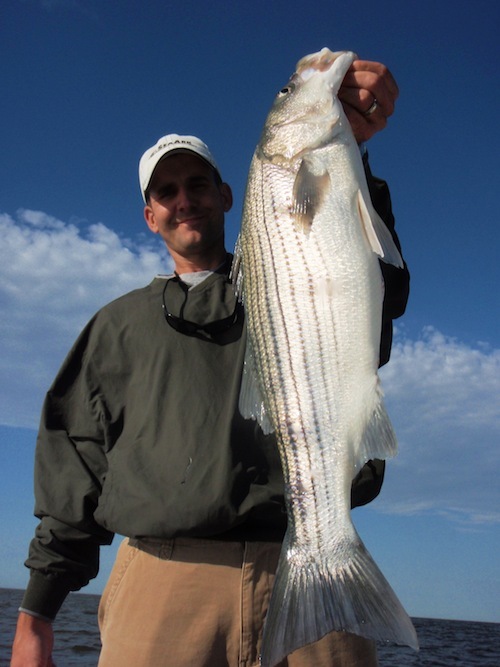 I’ve written about specific seasonal conditions in previous articles, so I won’t go over them all again, but I’ll say here that you need a basic knowledge of how striped bass behave in relation to the time of year before you can really start identifying patterns. Here’s a good place to start reading. 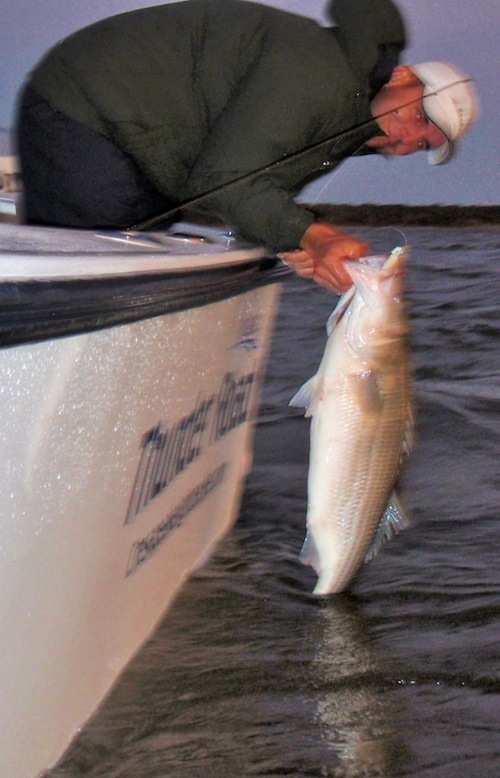 One of the best ways to find big stripers is to follow the big bait. 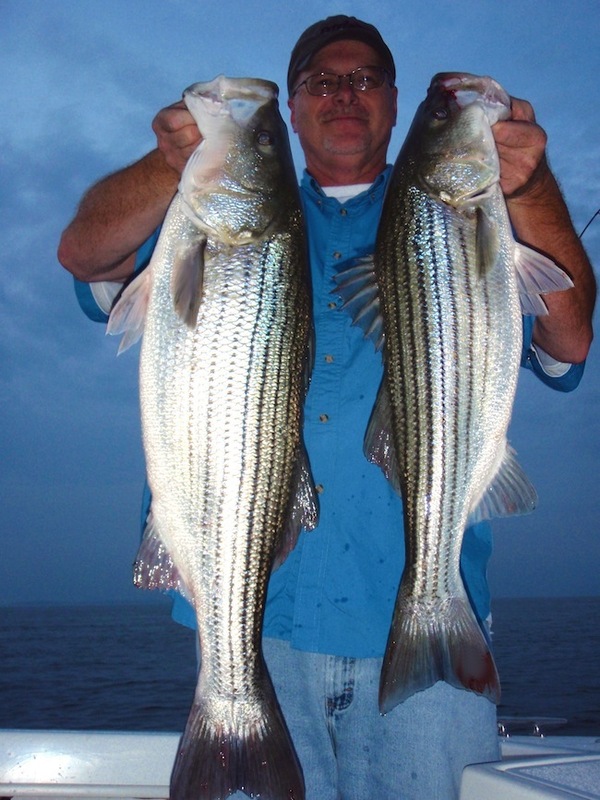 The favorite baitfish of big rockfish in the Chesapeake Bay is Atlantic Menhaden. There’s only one problem. Because of too much commercial harvesting, menhaden stocks are dwindling. There are usually only small pods of menhaden (or bunker as they’re commonly called) scattered across the Bay in the fall. 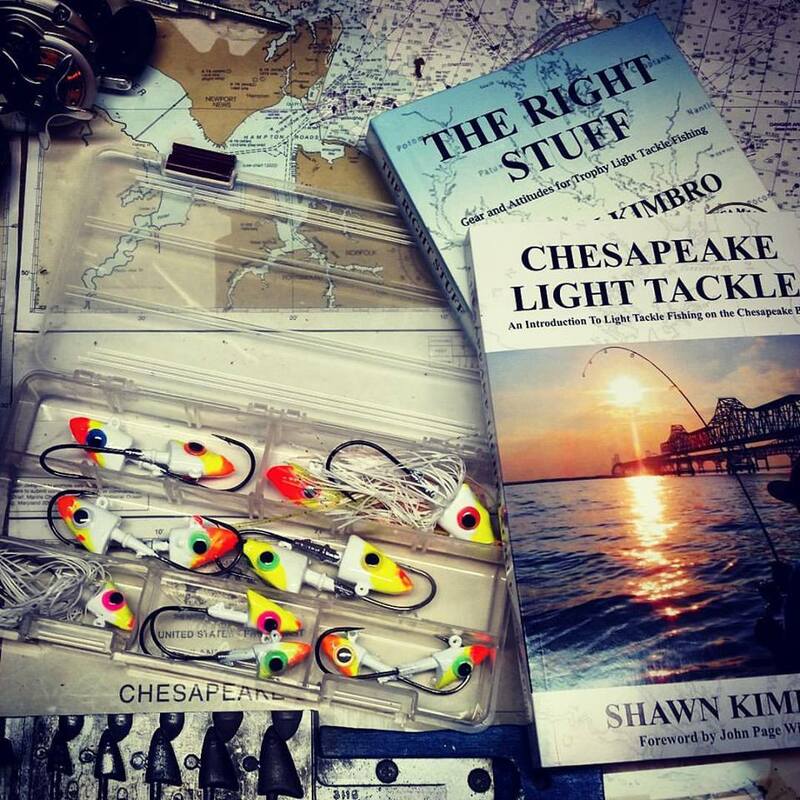 The days of mile long bait schools in the Chesapeake are long gone. Jigging under isolated menhaden schools can produce nice fish in late spring, but in the fall, it’s important to find the heaviest concentrations of the biggest and most mature bunker in the Bay. How do you do it? Patterns. Menhaden behave predictably just like other fish. 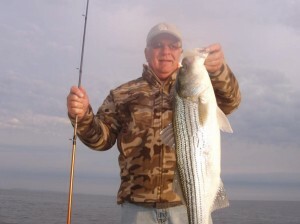 Like migratory stripers, they head south toward warmer water as winter approaches. Since menhaden spawn in the tributaries of the C hesapeake Bay in the fall, October rockfish know they can cut them off at the pass by staying close to the mouths of the biggest rivers. Rockfish also love alewife and blueback herring. Collectively known as river herring, they spawn in the spring, The young herring stay in the fresher water of the Chesapeake rivers until water temperatures drop in the fall. In October, they start their migration toward their parents who are already back in the Atlantic Ocean. Just like they do with menhaden, the stripers are waiting to ambush them on their way out of the rivers. Birds recognize the migration patterns as well. Gulls and terns look for rockfish ambushing bait because they can score free meals when stunned and mangled minnows float to the surface. Remember though, it takes a big bird to scarf down a mature 15-inch menhaden. In addition to big gulls, I occasionally see bald eagles diving into striper blitzes this time of year. Unless it’s a really tough day, there’s not much point in fishing under the huge flocks of juvenile gray-winged gulls that are so plentiful in the fall. Those little birds will only be over little fish. Just like the juvenile stripers and rockfish beneath them, the young seagulls are learning their skills of how to catch small bait like rain minnows and bay anchovies. You might get lucky and get a keeper beneath small gulls once in a while, but if you’re looking for bigger fish, look for birds that are big enough to eat the biggest bait. Like our prey, fishermen are also creatures of habit. It’s normal human behavior to go back to the same spot where we’ve been successful in the past. Unfortunately, the fish aren’t always there. Changing weather and current conditions make things especially tough in October. As the old saying goes, if you don’t like the weather, stick around and it’ll change. There isn’t much we can do about it, we just fish when we can. Despsite changing conditions, you’ve probably noticed that some fishermen are consistently successful. That’s because they’re thinking patterns, not places. Another important aspect to consider when evaluating a fishing pattern is current. Better fishermen optimize opportunities for success by fishing at places where currents are most favorable. 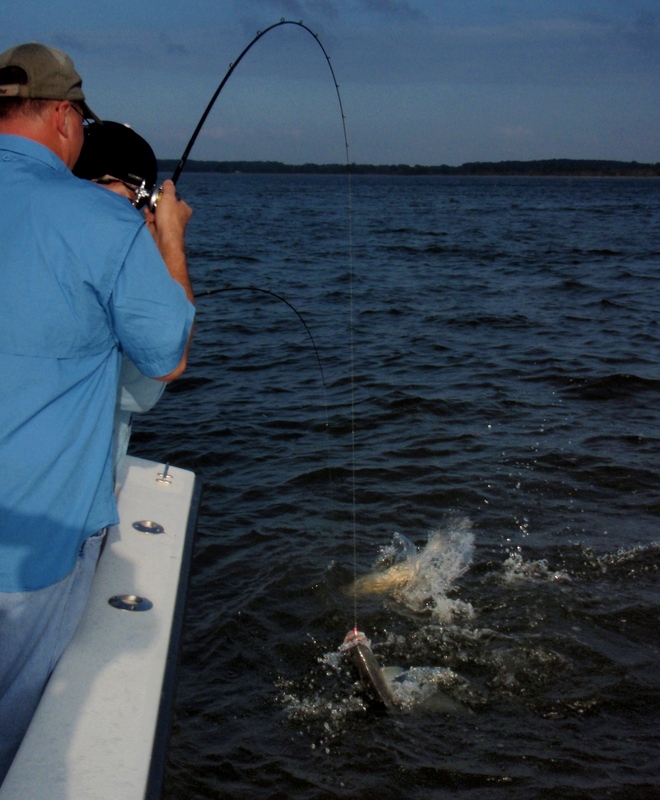 In high current areas, it takes more effort for baitfish to swim against the flow. That means they have less time to look out for predators. 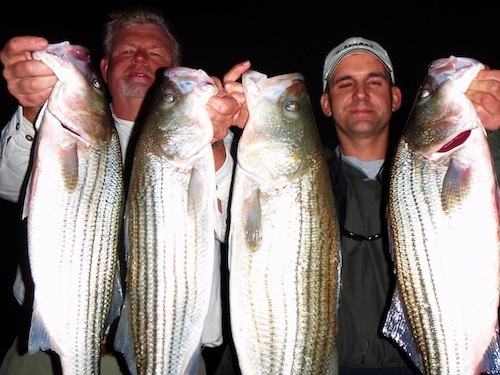 Stripers know it and wait to attack. Since we get two tide cycles a day on the Chesapeake, our currents are always changing. The best plan is to study the ebb and flow and watch how it behaves in different situations. In October, pay particularly close attention to places where the flow sweeps against shallow ledges, especially near the mouths of the big rivers. 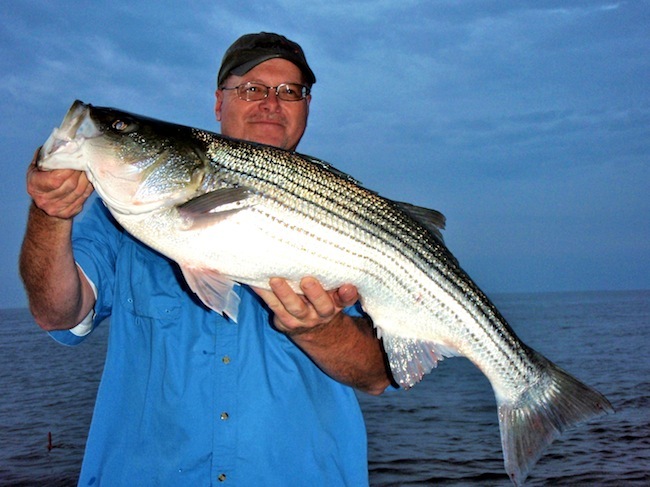 Current predictors on the Chesapeake Bay are notoriously inaccurate. I wouldn’t give you two cent s for one of the current flow charts that are built into some high-end fish finders. There’s just no way a years-old flow chart can account for the Chesapeake’s frequently changing meteorological conditions. If I ever look at a current graph, I check out the ones produced by the Chesapeake Bay Operational Forecast System (CBOFS) since they take predicted weather conditions into consideration. These regularly updated charts predict how currents will behave from day to day by using directional colored arrows. They’re computer generated, and never entirely accurate, but they at least show how the flow can go one way then another depending on conditions. Compare the CBOFS graphs to nautical charts that show bottom contour, look for back-flow where there is big bait, and you’ll be well on your way to planning a productive fishing day. My brother Creig is visiting this week. Despite tough conditions and busy work schedules, we managed to sneak in a few hours in the early mornings and late evenings to fish. Last weekend, I got out with my regular partners Jamie and Rich. We caught very nice fish on every trip by looking for big bait over humps, ledges and around structure where there is good water and moving current. 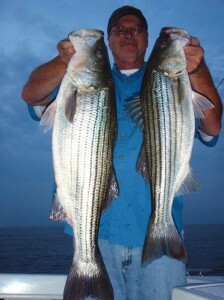 There has been no need to burn much gas in the boat because the fish are very close to home. In some cases, close enough to reach by casting from shore. This week I found a lot of fish holding right on the bottom in depths of 16-feet or less. Since one of the essential elements of the pattern is clean water, the biggest concentrations of rockfish are farther south than they were last year. We’ve been using a variety of soft-plastic baits for jigging including Gulp Jerk Shads, hot-rodded BKDs (white lures tipped with red or orange garlic dye have been hot), and Bass Assassins. Bigger lures have produced better fish, and my biggest fish of the week, a big round 37-incher, came on a 10-inch BKD. There’s also a good top-water bite along the shoreline. I’ve caught a few fish on top, and my buddy Jamie has been wearing them out in the shallows of the Mid-Bay rivers. Reports of big fish under big birds at the mouths of the rivers are just starting to come in, including some from the Upper Bay. 30-inch stripers on the jig and on big top-water plugs are not unusual right now, and I expect to see a few 40-inchers show up next week as water temperatures start to drop quickly. The patterns are coming together nicely, so good luck getting out there and finding a few secret places of your own! Another great read! Everything you said makes so much sense yet I don’t think there’s any way I could’ve learned it in such a way as I can right here on your site. Keep it up! Great looking fish, cut them up and fry up some rock fish bites.. Thanks Shawn! I know that reading about how to catch fish is no substitute for time on the water but you are coming pretty darn close. I’m startin to think like a fish. In fact, I’m even startin to look a little like a fish. Hope to see you out there someday. I noticed that too, Joe. Jim, we had rockfish last night. Can only imagine what the chefs at Razorbacks could do with some nice filets. Mike M. thanks for the comments. Get out there and get ’em! Congratulations to you and your fishing partners. These are the best fish I’ve seen since early last Spring. You guys really put your money where your mouth is. Not only did you catch them, but you told us you would a week in advance. I would say unbelievable, but I’ve said that before and I was proven wrong. I want to thank you for your talk at Annapolis MSSA last night. I started out taking notes but you threw so much information out there I couldn’t keep up. If there is a school of rock fishing, you are the dean. Ho ho, since you said recently there was an alternate reality from what most people thought. I’m not surprised they don’t believe it. Like another universe from the world they live in. I had some of this good stuff this week, and you nailed it. Excellent info,Shawn. Very nice fish! The fishing has been pretty darn good.I Hope to break the over 40″ mark soon. Thanks for the work & info you put into this site,steering me the right direction. once again another fine, tip filled, report Shawn. everyone can learn a thing or two from your site! things seem to be falling in place for a nice fall run….let’s hope the weather continues to cooperate. Thanks for the article. Great reading as always. The biggest problem I have is fishing enough to figure out a pattern. Your articles are always helpful in pointing me in the right direction but nothing like time on the water. Tight lines. Great talk in Crownsville last week. I read that you have a book. WHERE can I buy it?